During the 17th century, Dutch immigrants founded the colonial province of New Netherland, now known as New York. The Dutch planted cabbage along the Hudson River and often served it shredded in a salad they referred to as koolsla– kool meaning cabbage and sla meaning salad. 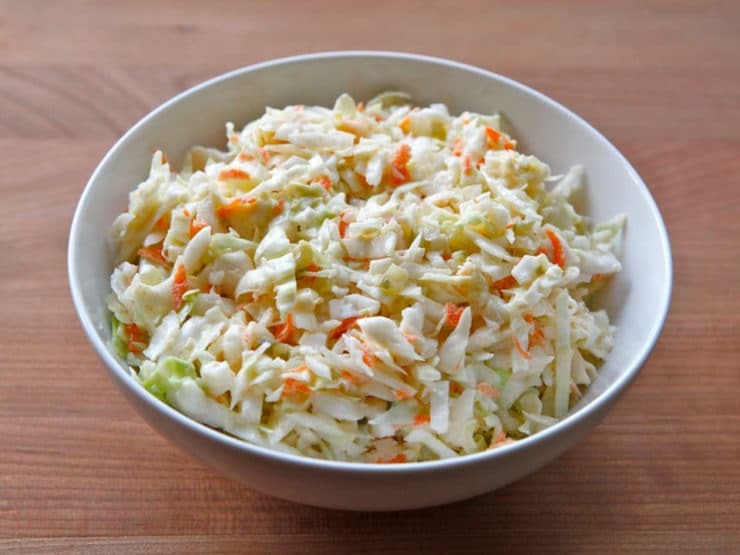 The dish grew in popularity throughout the colonies and eventually came to be known as coleslaw, or “slaw.” During the early 1900’s, as the Jewish deli culture gained momentum in New York, coleslaw proved to be a popular menu item because it could easily be made pareve (prepared without milk or meat). This meant coleslaw could be served alongside kosher meat items, including the ubiquitous pastrami on rye. 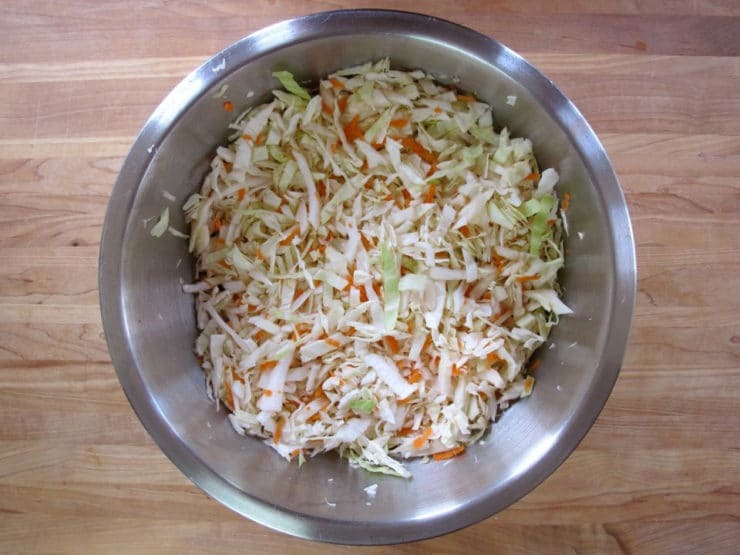 To learn how to shred cabbage for coleslaw (yes, there’s a bit of an art form to it), click here. This would make a terrific side for Super Bowl Sunday, or a picnic, or a barbecue… or any time you have a hankering for some classic coleslaw. Enjoy! Recipe for deli-style Pickle Slaw - coleslaw with cabbage, carrots, dill pickles and a creamy mayonnaise dressing. Perfect for picnics, barbecues. Combine the shredded cabbage and carrots in a large mixing bowl. 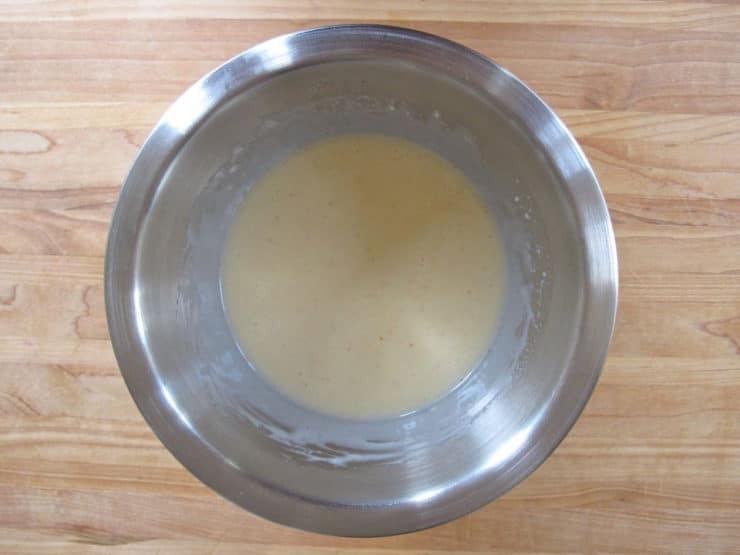 In a small mixing bowl, whisk together mayonnaise, rice vinegar, sugar, dill pickle juice, salt, and cayenne pepper. Pour the dressing over the cabbage and add the diced dill pickles. Stir and toss the salad till all of the cabbage is evenly coated with dressing. 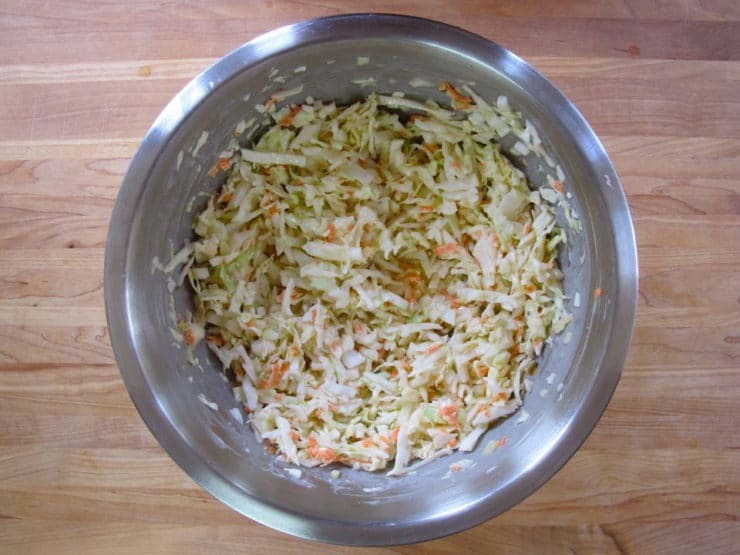 Place coleslaw in the refrigerator for at least 2 hours, up to overnight, stirring every so often. The dressing will collect in the bottom of the bowl over time. Just before serving, stir to redistribute the dressing throughout the salad. Serve cold. Does this -need- to set for a while? Or can it be served immediately? It can be served right away. Hey, this looks excellent. Will definitely make. Hope you don’t mind a guy posting here. Perfect coleslaw. I love the addition of dill pickles. The recipe looks excellent, and as soon as I get cabbage I will enjoy eating it. I have used unflavored almond milk to reduce the amount of mayo, and add some olive oil to the blend. I used balsamic in the past, but now only use apple cider vinegar for health reasons, how could I balance the accidity with a different type of vinegar. Hi Rita ….the cole slaw recipient sounds great. Will definitely try it but without cayenne pepper. Will it be okay? Is there any way to avoid using mayo for that recipe? Tori…could I use dill pickle relish for this dish?